So everyone got the 2017 UK general election outcome WRONG. Which included my UK house prices based analysis that was the most accurate predictor of the 2015 general election, however this time based on April house price data implied a Conservative win on 342 seats. So despite being the most accurate of all of the forecasts out there, nevertheless did get the election outcome wrong i.e. unlike for Trump there was no betting markets profits bonanza for this election. 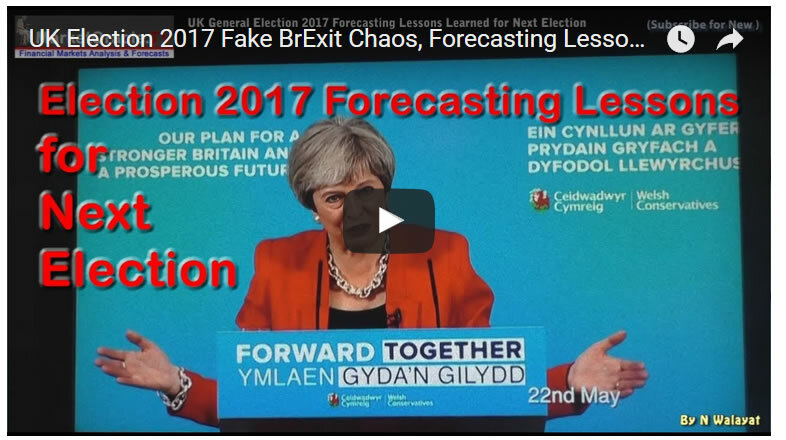 My video of 2nd July detailed 9 key lessons learned from the election of 2017 to be applied to more accurately forecast the NEXT UK general election. Which following reader demand is now repeated in text below. 1. SNAP Elections - Very little time to perform analysis so start work immediately. Unfortunately Theresa May's snap general election called on the back of opinion polls that suggested a huge landslide election victory thus implied we were all in for a very boring election campaign, so I found it difficult to motivate myself to get started on the analysis and only really started to do so just 2 weeks before polling day when normally I would begin the process a good 6 months before polling day, and seeking to conclude in a forecast at least 1 month before polling day as I did for Trump. Which means a lot of analysis was left undone, no economic analysis, no manifestos analysis. No analysis of mainstream anti-corbyn bias, no analysis of social media trends i.e. youtube video views. So the first lesson to learn is to recognise that snap general elections only provide for a very limited amount of time to perform all of the necessary analysis, which literally means to drop everything and throw oneself into the process virtually immediately following the election being called, else the probability for an accurate forecast outcome will be low. The need to remember that the house prices wealth effect is the MOST accurate forecaster for outcomes of UK general elections i.e. April data implied 342 Tory seats, whilst data for May released on 7th June implied just 334 Tory seats! By far the most accurate predictor. So house prices's analysis should be tasked as being of primary importance ahead of ALL other analysis. Getting an accurate gauge of house prices trend and momentum going into polling day is the key towards arriving at an accurate forecast conclusion, everything else should be secondary. Again it is necessary to undertake economic analysis for instance to answer questions such as are incomes rising or falling in real terms for how do voters feel about their personal circumstances. Where whilst in Mid 2015 real terms earnings were rising at the rate of 2.8%, i.e. the previous Chancellor George Osborne of timing the peak in earnings for the May 2015 general election. However this time Theresa May called the election for a time when the earnings had turned negative, a huge mistake. So economic indicators such as this are of great importance and which I completely failed to touch up on this time. It is very necessary to perform an analysis of the Manifesto's and whether they appeal to or repel sections of the electorate. The bigger the bribes the more appealing and the worse the pain the more repulsive. Clearly Labour won the manifesto bribes battle and Theresa May did not help her cause with the dementia tax. In fact the Tory manifesto really was a disaster as if it had been written to lose the election, and then Theresa May compounded matters by backtracking on one of her main policies, the dementia tax! 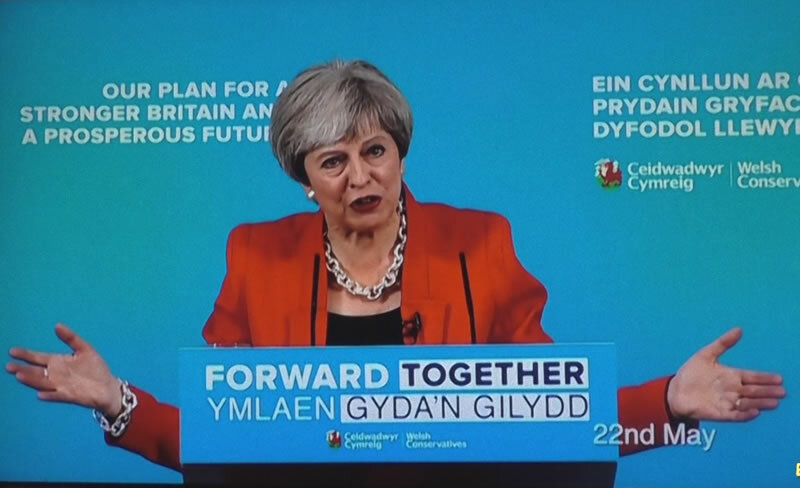 Which was probably that first time a party had done a u-turn on a manifesto pledge during an election campaign, which illustrates just how inept the Tory Manifesto and campaign management was. 5. Opinion Polls Do NOT Forecast Election Outcomes! I was already very skeptical of opinion pollsters at the start of the campaign. Nevertheless it is wise to realise that opinion polls really are worthless for forecasting the outcome of elections. For they are nothing more than propaganda tools for those who commission the polls, and with their large margins of error of typically +/5% ensure the pollsters can claim getting an election right even when they clearly got the outcome very badly wrong! Thus the only way the opinion pollsters will ever get an election right is through shear LUCK i.e. get 9 elections wrong in a row then yeah, they could get lucky on the tenth election. What this means is that if my forecast is converging with the pollsters forecasts then that should be a warning that my analysis is probably wrong and I need to go back and see what significant factors I may have missed. So the lesson learned is to use the Opinion pollster forecasts as a guide for what is the least probable election outcome. For the past few decades we have gotten used to political parties hugging the centre ground, i.e. the most centrist party tends to win the election. This time we had the greatest difference between Labour and the Conservatives since the early 1980's. Which on face value implied that this should benefit the Conservatives as being the most centrist party. However, instead the clear difference between the two parties galvanised those who had not voted for centrist parties for decades, and the young to support a left win Corbyn Labour party that surprised most Labour MP's who have centrist outlook. So the lesson here is to recognise that the greater the difference between parties means that the party most distant from the centre is likely to attract many new voters. Which can have a significant impact on an election outcome. The party leader definitely matters. Theresa May was exposed as being not strong and stable but AVERAGE. Repeatedly shown as being extremely uncomfortable on the campaign trail, even refusing to take part in leadership debates. Whilst Jeremy Corbyn is a natural campaigner who by the end of the campaign was even coming across an Evangelical! 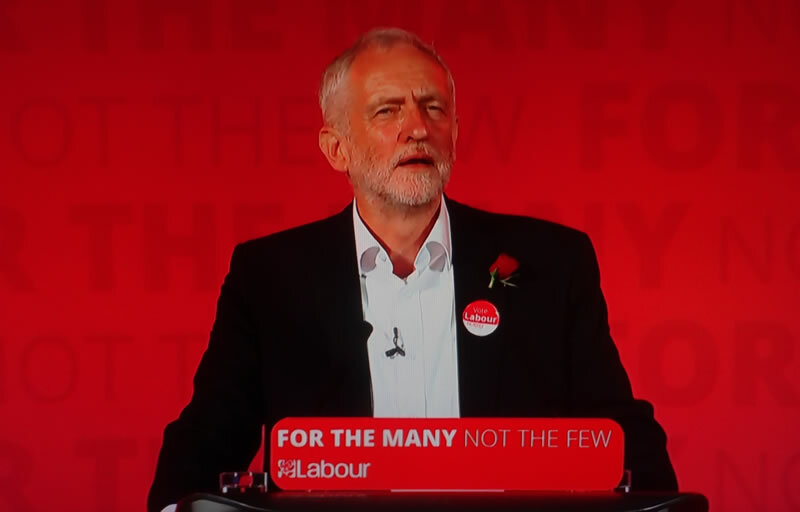 Jeremy Corbyn was by far the better campaigner during the election campaign and so an analysis of how the party leaders are presenting themselves to the electorate during the campaign is a very important factor that definitely makes a difference to election outcomes. Whilst it is necessary to watch mainstream media to keep pace with what is going on during an campaign., However, remember that it is ALL propaganda skewed, where in this election clearly was heavily biased AGAINST Jeremy Corbyn's Labour party. 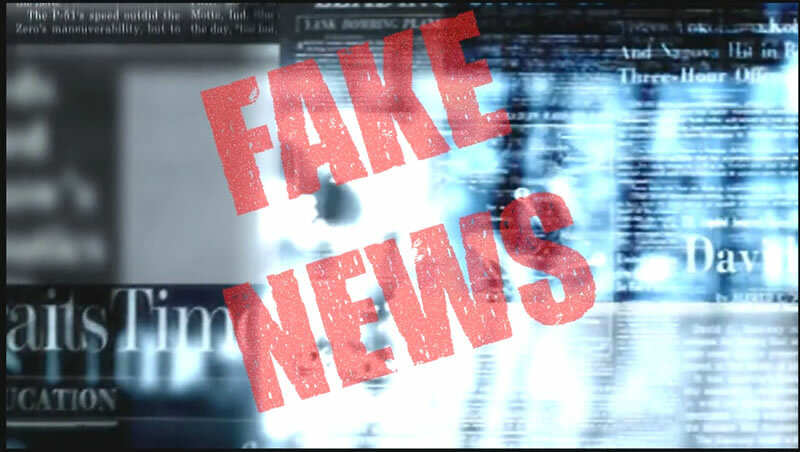 So always remember that you are watching and reading propaganda for journalists inhabit their own world that can be far detached from the real world of the bulk of the electorate. Marginal voters, the 10% or so in the middle tend to determine the outcome of elections and most of whom now tend to get most of their news, commentary and opinions from social media rather than the mainstream media. Therefore mainstream print and broadcast media at least where elections are concerned are irrelevant and continue to die a slow death. The key lesson here when determining the outcome of the next election is to pay attention to what's happened on social media rather than what the mainstream media are broadcasting i.e. which camp is winning the election war on social media. And lastly what is the overall message from each political party's campaign. Here the key lesson is that the party that has the more optimistic message will tend to outperform expectations. That which appeals to the concerns of ordinary people which is why Labour did well with their anti-austerity message and Theresa May did very badly with her Brexit Means Brexit message, one that promised PAIN whilst Labour promised bribes such as scrapping of tuition fees. So the Conservatives had an overall pessimistic message whilst Labour had an overall optimistic message, considering this then the Tories were lucky that they did not do even worse! Something to definitely remember for the next election. What is the overall message from each party, which party is most optimistic about the future. So these are my 9 key lessons learned for forecasting the outcome of the next UK general election, baring in mind that Snap general elections will be much harder to accurately call due to lack of time to analyse all areas, so one really needs to drop everything and start analysis immediately. As for when will the next general election be called ? Well clearly Theresa May is clearly a dead Tory Leader walking, and the Tories are a crippled party of government supported by heavily bribed Northern Ireland Protestant fundaments fanatics, so a crippled government where each by election loss will erode it's ability to get votes through the house of commons. Which means we may see another snap general election called during 2018 with the trend definitely in Labours favour towards at least becoming the largest party so that they can form their own coalition of chaos. 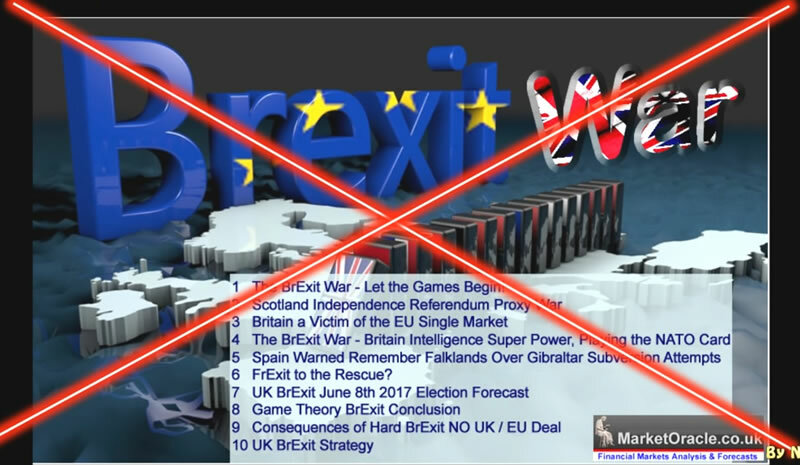 And as for brexit, well pre election I was mapping out in a comprehensive series of videos of why Britain would exit the European Union without any deal, a clean brexit, now all I can say is that there will be no EU deal by the deadline of 29th March 2019, which means it is likely the brexit can will be kicked down the road for many more years with a real risk of Brexit never happening. And do subscribe to our youtube and free newsletter for my forthcoming in-depth analysis and financial markets trend forecasts as hopefully we won't need to worry about another general election for at least a year.